The Tea Drinking English Rose: "She's got a ticket to Rye"
"She's got a ticket to Rye"
When I was a little TTDER I always thought 'that' Beatles song was about a ticket to Rye and I remember thinking that was really cool. But then I found out it was about some ticket to ride. I was very disappointed! On Saturday morning, after a plate of pain au chocolat and tea, and putting on my V&A necklace, Sebastian and I bought a ticket to Rye... to 'ride' on the train. If you have never been to Rye, you should. It's just outside of Kent in East Sussex and is just charming. The weather wasn't perfect but it was sunny and it felt like the first day of Autumn (which excites me so!). It was pretty nice weather to just amble and wander around the pokey cobbled streets in awe of every single building, front door and shop window. The pain au chocolat did not quite fill my insides enough so when I spotted a dear little sweet shop "Sweet Memories of Rye" I just had to pop in. There I found two large jars filled with Rose and Violet cremes. I chose both. Whilst nibbling, we walked along the pretty streets to find some lunch. We found the fish and chip shop that Sebastian promised would be the best chips I'd ever had. I promise you, they really were the best chips I've ever had! 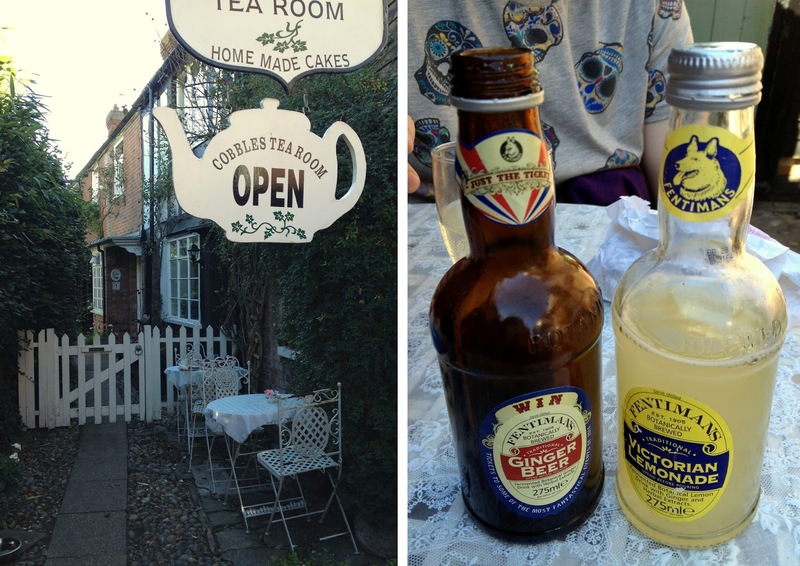 After a delightfully full stomach and a satisfied self, we started our treasure hunt for vintage and second-hand finds. We pootled into shop after shop. In and out the old buildings along the beautiful cobbled streets. I honestly could have bought so much. I would fill a backpack with old apothecary bottles, vintage china and darling teacups. Then I would buy a perfect antique suitcase and fill that up with vintage postcards, little floral thimbles, books on stamps and wild flowers. 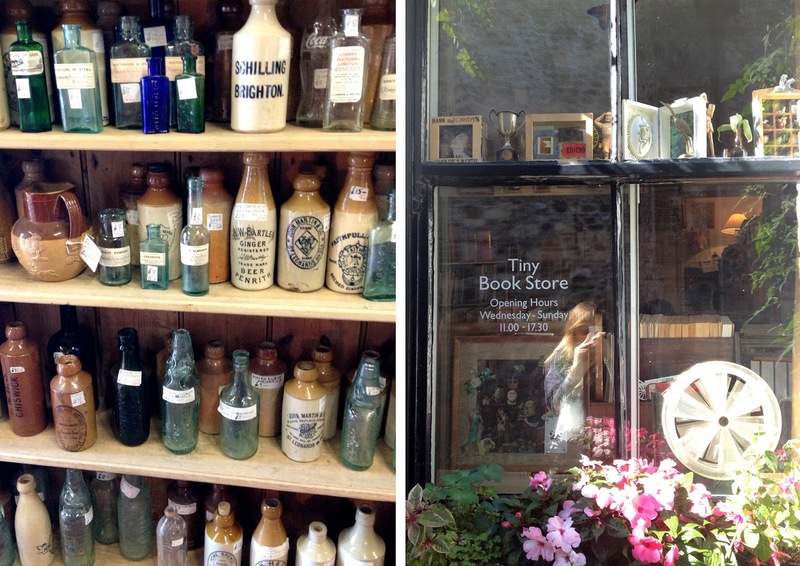 After the vintage treasure daydreaming, we wandered up Mermaid Street and took the beauty in. There are such wonderful buildings- Christmas Cottage, The House with Two Doors, Lamb house, The Old Vicarage and many more dreamy houses. If I cannot live in Paris or Tunbridge Wells.... Can I live here please?! After being in total awe with Mermaid Street, I thought that was the happiest I would be. I was so wrong. Along Lion Street was the most perfect shop. Lion Street Store. So many things to look at, to lust over and want. I would have emptied my purse in that beautiful place! Instead I took plenty of snaps. I wished I had bought a couple of cards, Rob Ryan's Rye mug, notebooks, stuffed treats, muted coloured candles, beautiful ceramics. Next Time! Before I let all the excitement get to my head, I suggested a little sit down in the little Cobbles Tea Room for a sip. 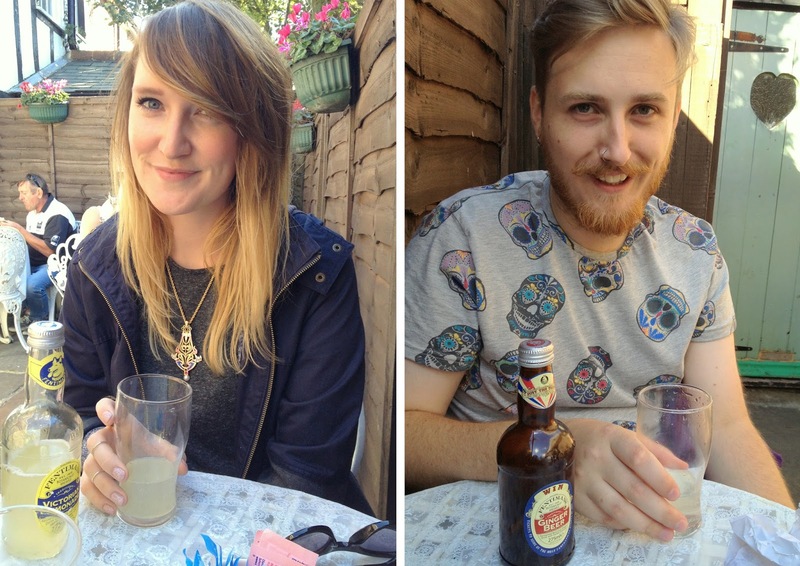 We ordered a Ginger Beer and a Victorian Lemonade. We laughed and sipped our pop whilst planning our walk back to the station to our train. I had such a lovely day. It was so nice to do something with Sebastian too as sometimes it is just hard to get time to go out... even though we live together and comfy days are nice, adventures are great too. Once we got home, we started planning our trip back there. I think I'd like to visit the Spa and pop back into THE store taking some treats back with me. It is all so lovely. I did manage to bring back a few finds. A tall Neon candle, a vintage tea plate, two sweet bottles, Lavender dark chocolate, and some rose and violet cremes. I was pretty impressed with my perfect pink candle and little glass bottles. It's so nice to go on an adventure. Ben and I forget to do this. Sometimes it's so easy to have comfy days at home. Although our comfy days often involve DIY (on Ben's part), so we really should plan an adventure more often. You would love Hay on Wye! It reminds me very much of this place. If you ever come to Wales with me for a Welsh adventure, we really should go! 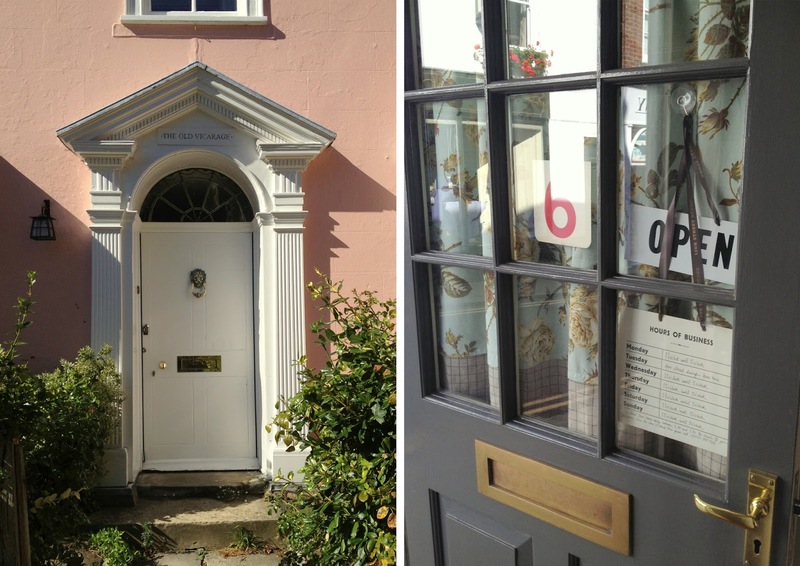 Firstly, gosh and golly I NEED TO GO TO RYE! I was in heaven looking at your pictures! Secondly, I have a whole tea set in design very similar to your plate! I'd say it's from the same series and certainly the same maker. It's the same except for not so much gold detailing. Got mine at a local auction and it's my best one (almost too scared to use it!). I'll instagram it later for you if you like for you to have a squiz! This is one of the best blog posts I have seen in a long time. I would love to visit Rye one day, it looks so beautiful there. Your photography is fantastic. This looks like a wonderful day out :-) Rye looks beautiful! I especially like the look of those fish & chips! This looks like the most perfect place in the world. When I think of England, I think of little places like this full of little shops and bookstores. I cannot cannot wait to go there. I don't think I'd leave! Rye looks so lovely, I'm going to see if i can get there on my free train tickets. I love the look of the lion street shop and I really want so neon candles after I saw an arrangement of them in shop opposite where I work, they they sold out!